This entry was posted in Economic fundamentals, Guest Post, The dismal science on February 1, 2017 by Yves Smith. Actually, that can easily be explained within the context of the textbook “savings capitalize loans for investment” thesis – it is more or less the rationale behind fractional reserve banking (FRB). Within the same framework, note that savings would only constrain lending if lending were near the leverage limit set by whatever (inverse) fraction applied to FRB system in question. Similarly, the fact that increases in savings rate often correlate negatively with business investment can be explained by people putting more money away when the economy is looking rocky – same reason central bankers’ pleas to consumers to do their patriotic duty and help fight downturns by spending like there’s no tomorrow tend to fall on deaf ears. This is not to say that the textbooks are correct – merely that many of the arguments put forth to ‘debunk’ the textbook explanation in fact do no such thing. As the “Criticisms of textbook descriptions of the monetary system” section of the Wikipedia entry on FRB notes, the crucial shortcoming of the textbook description is that it fails to deal with reality that in most modern economies money for investment is endogenous rather than exogenous. I’ve long been of the impression that even when they are doing their formal reserve requirement computations, the most important players in leverage booms such as led up to the 2008 crisis have a huge amount of leeway to play fast and loose with reserves – recall e.g. the GFC-era repeal of the FASB mark-to-market rules, all intended to allow mark-to-fantasy for ‘illiquid’ (polite euphemism for ‘toxic’). Given how things actually work, perhaps we should just use ‘fictional reserve banking’ as a descriptor for things – that way we give a nod to the theory while acknowledging the leverage-unconstrained reality. …the rationale behind fractional reserve banking (FRB). Every central bank in the World has gone on record that loans create deposits. Fractional reserve banking is a misnomer, a Rube Goldberg style mathematical exercise that has no real relationship to how money is actually created in the banking system. Yogi Berra did not say that. Computer scientist Jan L. A. van de Snepscheut (probably) did. It seems that it might be good to investigate if savings and investment are both correlated to the stage of the business-cycle. If that correlation exists and is not controlled for then the conclusions of the above report might not be as conclusive as hoped for. 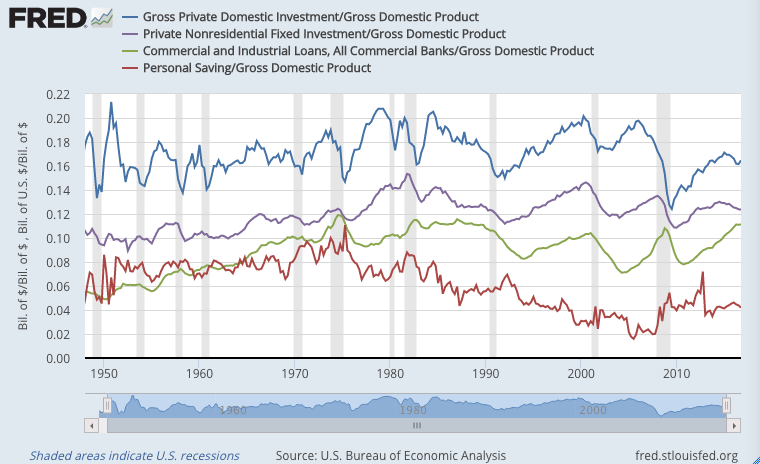 If you look at the shaded areas in the graph, you see that investments (non-residential and total) drop dramatically during recessions while lending drops with a short lag after the recession. Savings typically rise during the recession and usually drop during the expansionary phases. This seems to reinforce the conclusions of the above report. Gah — should read “illiquid … *assets*” in my above comment. But modern economics thought is an intense contorsive dance to eliminate consumption and aggregate demand from all equations. Duh, WTF: corporations save too. So do governments, in the rare event that they run surpluses. Not a good idea to criticize Econ 101 without having read the freakin’ textbook. I was gonna post a question about that. How can S = I when the graph shows them being so UN-equal? 1) the USD is the reserve currency of the empire – which has gone to war to preserve its status as the currency of international trade. It cannot be considered in isolation as if the US economy was a stand-alone national economy – it clearly is not. 2) International actors have massive USD positions – and this is ignored in the article’s analysis. 3) culturally, Americans are not savers – rather risk-taking borrowers – I’d like to see this analysis applied to an economy where saving is more culturally normal – Italy, or China, where savings rates often exceed 30%. 4) The USA is unique in that the central bank is privately-owned and run for the benefit of the banks that own it. This is a massive distortion in the money system. 5) Where banks can borrow at zero interest from the central bank, and savers earn maybe 0.25% on their savings, where is the incentive to banks to solicit savers, or for savers to save? Perhaps the reason the theory does not apply is that bankers have the power to run their affairs without needing the savings of the rubes. Exactly. It’s be interesting to see how the saving/lending/growth picture worked out if the analysis was limited to credit unions and local commercial banks. Imagine a middle class economy of 100,000 families where 10% of income is deposited as savings in local banks, average family income of $50,000 a year. $5000 x 100,000 = $500 million. Banks have to loan the money out at interest rates greater than the rate paid to savings account holders to earn a profit. Their market is people wishing to buy homes, automobiles, expand their small businesses, etc. So the banks will actively encourage people to buy their money and this will tend to spur investment and economic growth, it’s a fairly simple argument. You have to make a very convuleted argument to claim that this isn’t true; but if you can make that argument, it tends to justify credit bubbles, mergers of commercial and investment banking, the federal reserve printing mass amounts of money without fear of inflation since foreign countries are buying the petrodollar as reserve currency, etc. – the net effect of which is that wealth evaporates from the middle class into the pockets of the uber-wealthy. Seems obvious. The whole attraction to a savings account or CD is that I get interest on my money. Interest earned on my account derives from the interest on loan repayments, a fraction of which go into accounts and the rest stays with the financial company/institution. “Savings cause lending” is putting the cart before the horse. The checking and savings accounts are really just a way to “get you in the door” in the hopes that down the line you’ll do more business with the bank, in the form of taking out a home/auto/business loan. I never completely understood the savings = investment thing either. Let’s say I got a 10 bagger and ended up with $1000. Let’s say I put it in a checking account. That’s savings but how is it investment? Then let’s say I go out and buy a $300 video game “Redneck Nation” where you can be a liberull and drive around and run over unemployed meth-addict rednecks with your car or shoot them as they run away. Each time you hit one the sound effects are awesome. If you hit 10 in 5 minutes it plays Lnnyrd Skynnard’s Sweet Home Alabama. Let’s say the game developer makes yuuuuuge amounts of money and puts it in a cash account invested in govermint securities. That’s not investment either but it’s savings. Only one minor nit. Correlation is a measure of linearity. The slope of the implied line doesn’t have to be 45 degrees. In other words, consider the x,y pairs 1,3, 2,6, 3,9, 4,12, 5,15. If you ran a correlation it would be “1”. Linearity, and therefor correlation of 1 (or -1), can exist even if one variable changes in magnitude more than the other — provided the relationship between the two variable is linear, i.e. of the form y=ax + b; where b is a constant and can be zero. S = I means the total savings in the economy equals the total investment. The two are connected via inventories, increases in inventories count as investment. Gosh, could it be that if people are “saving” they are not “buying” so much so demand is lower, which means business has little reason to expand? I think economists devising little simplistic statements such as the one offered are just one more reason to not trust economists. They do not seem to know what they are doing … or they do and it is serving a master other than us. That was what Keynes thought. Savings and investment remain equal at all times, but they stay the same via the level of output changing to keep them the same. Banks create the money they lend out of nothing, it’s called fractional reserve banking. After years of lobbying the reserves they need are almost nothing, a fee on a mortgage can contain the required reserve by itself. In the UK the banks held £1.25 in reserves for every £100 lent out in 2008. Money is created by loans and destroyed by the repayments. Savings did play a role with higher reserve ratios but today they are almost irrelevant. When economists get the hang of how money works they will know why austerity doesn’t work and be able to see events like 2008 coming. If John Doe goes into a bank and signs a bit of paper that says he owes the bank10000 dollars, that very act creates 10000 dollars. John Doe has just created 10000 dollars out of thin air, by the fact that he pledges his working capability over the next few years. The problem with these John Doe money is getting it accepted, as Hyman Minsky rightly said. So the bank acts as a risk assessing agency and as a risk taker and converts the John Doe money to US Dollars money, and receives interest for its risk taking. The John Doe pledge for 10000 dollars becomes a bank asset, and John Doe gets 10k USD in his bank account. Loans create Deposits. But before that the people create the money by assuming debt. That is another way of looking at it and the basis of double entry book keeping. The bank can claim the asset if the borrower defaults, which is the whole idea. Banks do create money out of nothing but it equates to you borrowing your own money from the future and paying the interest for this service. The bank creates the money out of nothing, which is your own money from the future. You pay it back plus the interest for the service rendered. If you default the bank repossesses the asset to pay off the debt. It all works well if banks lend prudently, but they don’t. Loads of new money/debt comes into being before 2008 (M3 going vertical). It is a huge asset bubble, when the bubble bursts people can’t repay their debt and the asset has fallen sharply in price so the bank can’t recoup the money to pay off the debt. Today’s record global debt is our own money borrowed from the future. The future is massively impoverished before we get there. You buy the house with the money the bank lends you now. In the future you pay that money back plus the interest. The bank creates the money out of nothing for you to buy the house now. You pay it back plus interest in the future. It is moving your money from the future to the present. That’s right. The necessary condition for money to be created through the banking system is for willing and able borrowers to walk through the doors and take out loans. Banks are always pushing on a string. Minor quibble. MMT has very little to say about banking other than money created through the system nets to zero, thus adds no net financial assets to the non-government. MMT focuses on the flow of funds between the government and non-government, exogenous money, ie net financial assets. I assume MMT is in the link. No it’s not. There is no such thing as fractional reserve banking. Every central bank in the World agrees…loans create deposits. Fractional reserve banking implies the opposite. No one told the mainstream economists. I may be using the term fractional reserve banking incorrectly. I have used it just to mean there is supposed to be a fraction as a reserve though in some cases I think this is now actually zero. The mechanisms above are OK. When you put your money into a bank, the bank is required to keep a certain percentage, a fraction, of that money on reserve at the bank, but the bank can lend the rest out . For instance, if you deposit $100,000 at the bank and the bank has a reserve requirement of 10 percent, the bank must keep $10,000 of your money on reserve and can lend out the $90,000. The big problem with all this is the fact that banks are never reserve-constrained. A bank can always make a loan to a qualified borrower that walks through it’s doors and acquire the necessary reserves after-the-fact, either from another bank in the system with excess reserves or through the Fed discount window (albeit at a higher rate). It wouldn’t matter if the reserve requirement was 100%. The bank could always make the loan ( and make a profit, which leads to higher reserves). So the fractional-reserve story above becomes moot, and has nothing to do with the actual process, while fueling the (false) notion that banks lend out deposits. Which leads to the false “loanable funds theory” on which much of neoclassical economics is based. Paul Krugman subscribes to this so-called ‘theory’. It is this theory that underpins the arguments that ‘we are going bankrupt’ or ‘we can’t afford’ to do this or that. Belief in this theory is the the main reason we can’t have nice things. This is why any reference to a so-called ‘fractional-reserve banking’ model must be exorcised from any discussion of economics or monetary systems. Which is what MMT is working to do. MMT is a reality-based view of economics. We measure economic output in terms of GDP, which is a flow of funds. MMT is based on an accounting view of the flow of funds and a working knowledge of actual banking operations as opposed to stylized descriptions like fractional reserve banking. Banks don’t lend out deposits. Every penny of a loan is created from nothing. Your money (deposits) remains in your account and is always accessible by you.